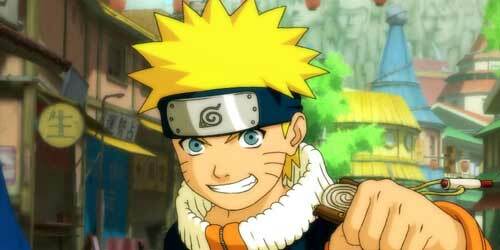 Naruto Uzumaki, a famous hero in Japanese anime. The characters in these comics is quite easy to draw with pencil step by step. If you want to learn how to portray anime pictures, try to start with this guy learning how to draw Naruto. Draw a smooth circle in the center of the sheet. If this turns out bad, you can use a compass. It is also convenient to draw smooth circles with a stencil. As it is possible to use any jar or glass. Trace the stencil with a pencil carefully in his path. Guide smooth a vertical line, dividing her circle into two parts. Slightly below the middle, draw a horizontal band. You got the markup that you will be able to easily draw a face animessage character. Just above the horizontal lines of the guide is slightly concave to the bottom line. From it draw the shape of the face of the boy. These lines should be slightly convex. At the bottom end the figure slightly rounded sharp chin. To draw Naruto with pencil, add the oval of the face outline eyes, nose and mouth. Eyes to place it on a horizontal line marking in the form of large tonsils. While the nozzle will consist of two points. Place the mouth on the lower line of the circle marking. Add the pupils for drawing and paint over them. Draw two small lines in the area of hair growth. Swipe a curved line of the eyebrows Naruto. Don't forget to add the stripes on his cheeks. Draw the ears of an anime character, placing them on a level vertical line. Draw the picture bandage with cascading her hair. Complete picture picture of haircuts Naruto as a cartoon hedgehog. Draw the details of the bandage guy. So you have got to draw Naruto step by step. Now draw the main lines of the picture with a pencil, increasing the pressure, and the extra details wipe with an eraser. Paint your drawing.